Let me help curate your family print collection, stress-free! With a 1-on-1 consultation in the comfort of your home, I will help you make the best choice of size, finish and frame that will suit perfectly in your home. Using photos of rooms from your home, I will upload your favourite images and provide recommendations on layouts and size options. We will work through what works best for your space, style and budget to suit each individual room. Here are some examples of what you can expect to see during the consultation. 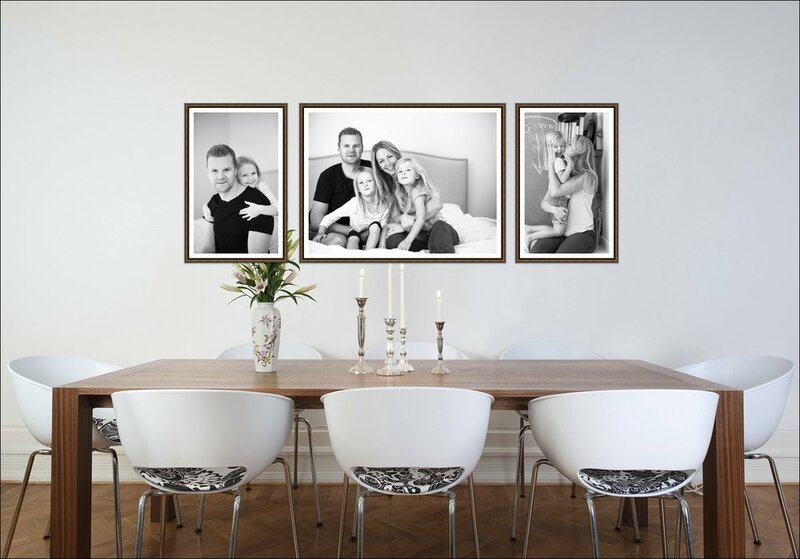 We will review a handful of frame options to choose from when customizing your prints for your space. Ranging in a variety of sizes and materials, I will help you select the best option for your family and your space. An alternative to framing is to mount your prints. I will walk through the various options available to you during our consultation. Mounting on acrylic or metal is a modern alternative to framing and will feel like a priceless piece of art in your home. Having the flexibility to custom size the prints to fit your space allows us to create a perfectly suited collection for your home. We can increase or decrease the sizes so they are a perfect fit! to come help you create a custom print collection for you and your amazing family. Reach out to book a consultation so we can get started!